Claiming two wins from four starts, five-year old gelding Night’s Watch has enjoyed a strong start to the Spring, but champion trainer Darren Weir sounded only half confident when asked on his chances ahead of Saturday’s $5 million Caulfield Cup (2400m). Night’s Watch, above, backs up this weekend in the Caulfield Cup after running sixth last weekend. Photo Credit: Ultimate Racing Photos. “Whether it’s all sort of come a bit quick for him I don’t know,” Weir told RSN’s Racing Pulse on Friday morning. While Weir compared Night’s Watch to fellow stablemate and $5.00 Cup favourite, Kings Will Dream, the difference between the two is obvious. Night’s Watch has drawn the second-widest gate on Saturday, barrier 18, while Kings Will Dream will enjoy the perfect start jumping from barrier six. “He’s got the tricky barrier to overcome, and I guess when you draw there you’re sort of committed to ride one way and that’ll be to be ridden quiet,” Weir went on to say. 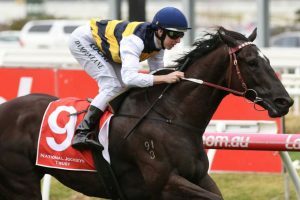 After winning the Group 3 Naturalism Stakes over 2000m a month ago, Night’s Watch seemed to struggle with the same distance last weekend in the Group 1 Ladbrokes Caulfield Stakes. In opposite fashion, the New Zealand import drew barrier three last start, but struggled to kick home down the straight after shifting from a three-wide position to the inside part of the track. Jockey Ben Allen gets the ride on Night’s Watch again on Saturday, but Weir admits he’s hoping for a similar ride on the outside. “Try and get into a three-wide sort of lane and get a bit of a cart into the race and be riding to be strong late” Weir said. As for the step up to the mile and a half, Weir liked what he saw from Night’s Watch last weekend, but admits it wasn’t great. At long $17.00 odds, Night’s Watch enters on the third line of betting with Ladbrokes.